Wearing leather jackets is a need in some western countries as the weather remains chilling round the year. But from quite a time it has become a great fashion statement especially for the men all over the world. Beautiful leather jackets featured by men and women in the world showing in the commercials has fueled the trend. Biking, adventure sports, and leather jackets are synonyms today among the youngsters, thanks to the travel sites and commercials. All Saints is the brand which makes beautiful leather jackets of different colors patterns and style for both men and women. It is an UK based brand. The jacket styles include All Leathers, Biker Jackets, Bomber Jackets, Black Leather, Suede Jackets etc. The jackets made by this brand are quite expensive. Other than European countries, the jackets can be purchased from China and Japan among the Asian countries online. Zipped, buttoned, broad collars, high neck, sporty etc. are the styles one can find in the jackets made by this brand. Marc Jacobs is a US Based brand and makes awesome leather jackets especially for women. Marc Jacob is actually a renowned designer in the USA who has defined the American Fashion in a new way. Leather jackets are shipped to the countries like – Austria, Belgium, Canada, Cyprus, Estonia, Finland, France, Germany, Greece, Hong Kong, Ireland, Italy, Japan, Latvia, Lithuania, Malta, Netherlands, Portugal, Slovakia, Slovenia, Spain, United Kingdom and the United States. In many other countries, jackets from this brand are available by retailers, both online and offline. Balmain is considered to be one of the best leather jacket brands in the world. The super high-quality leathers and stunning design have made this brand very popular among the young fashionistas in the world. Pressed collar, high collar, side zipped, buttoned etc. are among the best seller designs all over the world. Due to its higher brand value, this jacket brand is quite expensive. The Balmian is a France-based brand and makes exclusive designs that have made it a known name in the fashion industry, despite the expensive range of products. A USA based brand John Varvatos is quite a known name in the fashion industry for its clothes, shoes, fashion accessories and other leather stuff. The most popular product of this brand is their leather jacket. 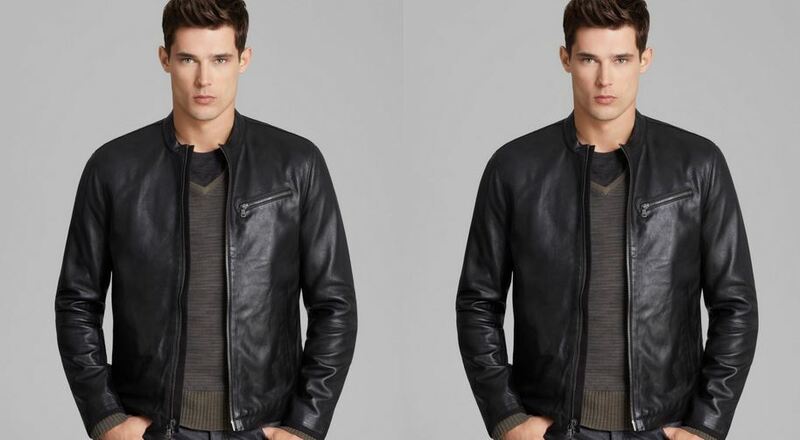 John Varvatos makes leather jackets for both men and women. Good quality leather and trendy designs that anyone can carry every day are the main characteristics of this brand. They use the different type of leathers and colors to make the jackets even more attractive. All over the world, these jackets are found through retailers. Gucci needs no introduction in the fashion world as they are considered to be the best in making trendy and exclusive designer leather products like bags, fashion accessories, shoes and jackets. Leather jackets need not be boring always and this statement is proved by Gucci. They use patches, embellishments and thread work to make the leather jackets the most wanted among youngsters. These exclusive jackets, which are adored by both men and women have become the symbol of status, power, and class. Hugo Boss AG is a fashion brand based in Germany. They have a style house in Metzingen, Germany. Quite a known brand and found all over the world through retailers, both online and offline. Premium materials, cuts, and designs are the well-known feature of the jackets made by Hugo Boss. Classy, sporty and casual – all the styles are found in their jackets. Mainly made for men, these jackets have great material and all the designs have been crafted with individuality. A USA based exclusive fashion brand, Salvatore Ferragamo S.P.A makes the world’s one of the most exclusive and expensive leather bags, accessories, outwears, blazers, jackets etc. materials of the jackets are quite sturdy and soft at the same time. This brand makes the trendy reversible jackets which are quite popular among youngsters these days. They have stores in many countries and continents, all over the world including India. People can buy their jackets from online retailers both online and offline. Established in 1903, Harley Davidson is one of the best motorcycle manufacturing company in the world. This company is passing its legacy of class and style to the youngsters through making accessories like jackets. Like their bikes, Harley Davidson made leather jackets are the fashion statement for both men and women. They make mainly sporty biker jackets which can be worn in extreme weathers during long bike journeys. Very breathable and great leather quality and best sporty designs are loved by the young men and women all over the world. Color, texture, style and pattern- these are the words for jackets made by Burberry. Established in 1856, Burberry is a name for making jackets that are both trendy and can be utilized in different ways. They have made famous trench coats to serve the army and military men during the war and extreme conditions in the early 20th century. Very lightweight, awesome leather and quilted patterns are the most important features of the jackets. The fabric of the jackets are handpicked, expensive and designs are unique. Available all over the world through retailers and their stores. Coach is a well-known US based fashion brand and famous for its leather accessories and jackets. The exclusive designs are best suited for both runway and day to day use. Their season based designs, cuts and colors are the talk about in fashion industry and a fashion statement for both men and women. Innovative hues, leathers and the essence of nature in all their jackets makes them quite different from all other jacket brands. Having international stores in almost all the continents and countries like India, China, Japan, Thailand, Vietnam etc. Their products are available through the retailers also and shipped almost all the countries. This is just a very small list of brands that makes leather jackets . There are many other well-known brands like Versace, Zara Man, Tough Jean smith, Versace, Ralph Lauren Corporation, Timberland etc. which make unique leather jackets. Black, brown, gray and tanned leather are mainly used for jackets. However, suede and different utility based jackets are now created and crafted by the well-known brands these days. Wow! Nice jacket to wear. Fadcloset also provides such type of jackets, which comfort to wear. Looking for a soft leather jacket casual style not with lots of bits attached. Hope you are fine and doing good. We are Custom sports clothing factory from Pakistan. Jackets,Bags,Gloves etc etc we can provide you as your requirements and under your art work. Let us know please . Looking Forward your kind response.